In my last blog, I discussed how being genuine, or transparent in product ingredients and labeling, is key to rebuilding trust between brands and consumers. However, there is another way to re-build those relationships: Environmentally friendly packaging. Using eco-friendly packaging and being committed to sustainability is an ongoing trend that will be the price of entry for brands. There has been much discussion about sustainability in packaging and what consumers want. For example, is the package recyclable? If so, what is the best way to recycle it? Making it easier for consumers to recycle packaging and to know they are doing what’s best for the environment can go a long way. Programs like How2Recycle help alleviate confusion about how to recycle goods by using easy-to-read graphics. But being eco-friendly goes beyond consumer recycling. Corporate transparency around environmental consciousness is becoming increasingly important. How are you committed to decreasing your environmental impact? What is your commitment to social responsibility? How is that communicated on your packaging or through your marketing efforts? 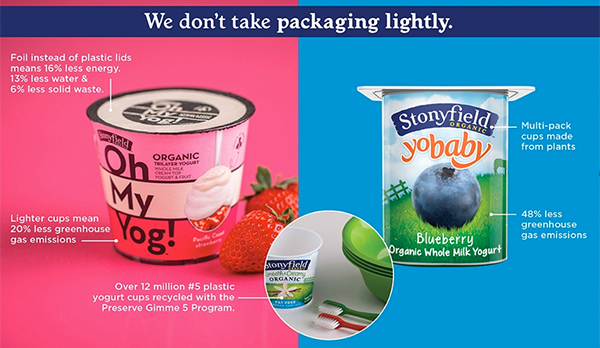 Stonyfield Farms is a good example of a brand committed to being eco-friendly. From organic farming to more sustainable packaging, Stonyfield Farms is a leader in the promise to be green and eco-friendly. They have focused on reducing how much packaging they use, specifically eliminating plastic lids, and have moved to packaging materials that are plant based and emit less greenhouse gas. The result has been a significant reduction in their environmental impact. To learn more about their efforts, check out their story at http://www.stonyfield.com/sustainability. In the end, I believe this trend will continue to gain traction as consumers drive the demand for manufacturers to explore other substrates and packaging options as well as manufacturing alternatives. And that impacts sales. The Sustainability Imperative study published by Nielsen in October 2015 states that 66% of consumers worldwide are willing to pay more for products and services from companies who have committed to a positive social and environmental impact. This is up from 55% in 2014 and 50% in 2013. In addition, brands that demonstrated commitment to sustainability grew over 4% in 2014 and those that did not saw less than 1% growth. Given these numbers, eco-friendly packaging is here to stay, and will continue grow… literally. Do you consider your brand to be eco-friendly? How are you using packaging to represent your efforts? Let us know in the comment section below. We can help you create package design that best reflects your commitment to being environmentally conscious. To learn more about our packaging design capabilities, click here.